L.J. Systems Stair Systems | 41 Lumber - Serving Iron Mountain and the U.P. L.J. Smith offers the broadest and most comprehensive line of quality interior stair parts with 41 different wood baluster styles, 50 newel styles, 27 handrail profiles and 37 styles of ornamental iron balusters for use with their wood rail and newel posts. All wood products are available in a variety of wood species including oak, beech, poplar, maple and cherry. 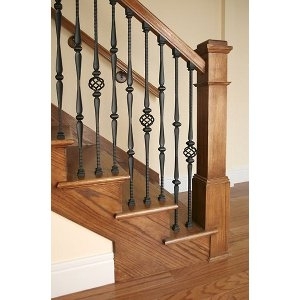 Many baluster patterns are available with a factory primer coat for interior painting. The ornamental iron balusters are available with six popular powder coat finishes.